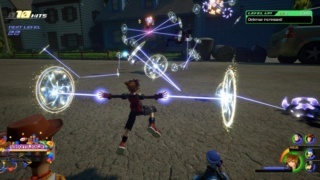 The story in Kingdom Hearts III is decent although some things pan out differently than they really should have based on previous games, such as Organization XIII members who instead of provoking Sora and the gang into fighting them, they instead just provoke the gang and then run away. 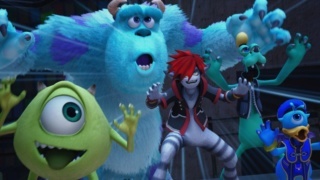 The Disney themed stories are quite enjoyable as expected and the inclusion of Pixar worlds and characters is amazing, however Kingdom Hearts III mentions the Final Fantasy characters one time in the game and you never actually see any of them which is a seriously bone-headed move in our opinions as the Final Fantasy characters actually had more important roles than the lion's share of the Disney characters in previous games in the series. Things actually get worse in the last 10-15 hours of the game as the story shifts focus to the Kingdom Hearts exclusive characters and everything feels like a rushed hot-mess that should have been 30-40 hours worth of story condensed into roughly a third of that time. It really hurts the game's storytelling, however worst of all the ending itself was unnecessary in our opinions and we'll leave it at that as to not spoil anything for you, our loyal viewers. All we can say is that the ending will catch you completely off-guard. The gameplay is top-notch as expected from a game in the Kingdom Hearts series. The game's famous action-packed combat is back and tweaked to perfection! 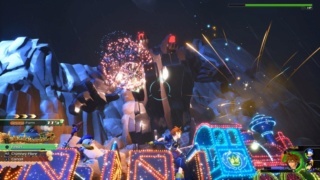 The battles feel like a combination of the best aspects of the first two main Kingdom Hearts games, plus a few new features such as attraction commands have been added allowing you to summon Disney theme park attractions to deal a tremendous amount of damage to enemies and bosses and in some cases while a gorgeous spectacle, it makes boss battles far too easy to win. The minigames are kind of disappointing this time around which is rather unfortunate. The Gummi Ship battles are very disappointing as well and can be ridiculously difficult and time-consuming at times to the point of taking a good third of the game's actual length. The controls are pretty easy to learn which is always nice. The audio-visual presentation is absolutely breathtaking in Kingdom Hearts III, with gorgeous worlds brimming with detail and absolutely gorgeous characters and top-notch special effects. This game is clearly Triple-A through and through, and the soundtrack is amazing as well. 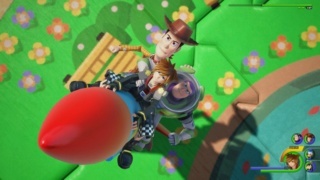 Bottom-Line: With superb gameplay, an amazing audio-visual presentation, and good controls Kingdom Hearts III is a good game that is worth getting if you are a fan of the series or Action-RPG's in general, however a rushed story and terrible ending ruin the experience and the game's somewhat short length doesn't help matters. 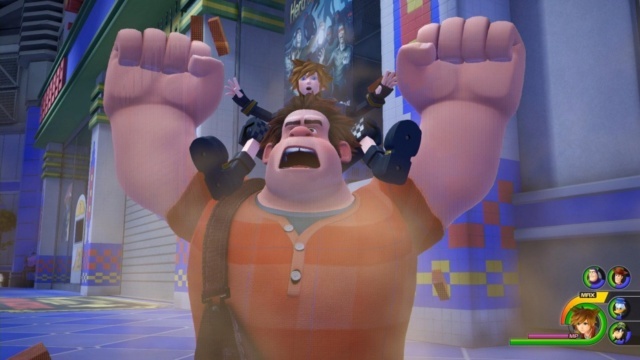 Overall we do give Kingdom Hearts III for the PS4 a good level of recommendation. I completely agree with your criticisms and yes the ending was simply dreadful. Nice review @Towafan7. You continue to improve as a reviewer lol. Wonderful review yet again @Towafan7! Great review! I haven’t gotten very far in the game, but I agree with what you’ve said about it so far. Great, solid review! So...anyone else figured out why Final Fantasy VIII isn't coming to Switch, even though both VII and IX have? ...whaddaya mean, "Zack, that question has nothing to do with Kingdom Hearts, you loveable goofball!"? Selphie from FFVIII also appears in Kingdom Hearts, doesn't she? NOW call me a loveable goofball. I DARE ya! @Towafan7 Holey bottomless pit stain! This review's your most well-written yet! @Anime_Gurl I know. I was just puzzled is all. Besides, it's been playable on multiple PlayStation consoles, so it's weird that it skipped Nintendo Switch while its PSX brethren are both available right now. That was a cool review and I can see where you're coming from based off of what I've watched of the game so far. I do want to play it so I haven't watched too much. Awesome review man! This might be your best yet mate! Great review! I agree that the ending was terrible in fact the worst in video game history in my honest opinion. Nice review! You've really stepped up your reviewing skills over your past few reviews. Kingdom Hearts III while fun, was extremely disappointing. What a lackluster conclusion to an otherwise excellent series. Thanks for the feedback! You guys rock! Excellent review Towa. I agree completely with your review!